In this episode of The Functional Medicine Radio Show, Dr. Carri’s special guest Kristen Thomas explains how to restore digestive system health. 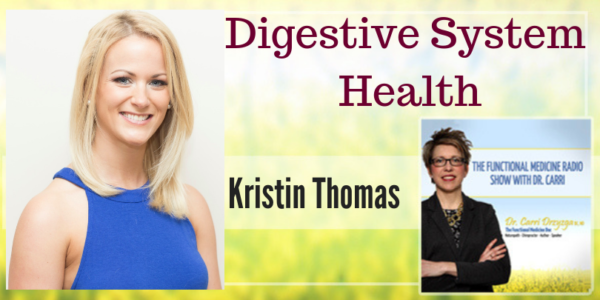 Kristen Thomas is a certified functional diagnostic nutrition practitioner and holistic health coach with additional training in digestive system health, hormone balancing, SIBO, thyroid conditions, detoxification, and stealth infectious disease. She has lived through chronic illness and reversed her own ulcerative colitis and other health challenges such as leaky gut, food sensitivities, hormone imbalance, and a half-dozen gut infections. How did you heal your digestive system from ulcerative colitis and gut infections? What gut testing did you do and what infections were found? What are some of the signs and symptoms that can hint at a potential digestive health problem that people may not necessarily associate with the gut? What are the most common digestive issues that you see in your practice? What is the baking soda test? What are three things that listeners can start doing today to begin to improve their digestion? What are some of the things that you see most people are not doing? What are some of the things that you have people do or change in their lives so that it sets them up for success so that they are chewing their food? I started to do some research in terms of how I could turn to food as medicine because, at that point, I just knew that a lot of foods weren’t working for me, and I saw a pretty direct correlation between when I ate foods and my ulcerative colitis symptoms flaring up, so I figured that was the first place that I could begin. I began to eat I guess we could call a Paleo Diet – clean meats, veggies, fruits, things like that. Within two weeks, I felt a world of difference. I started working with several functional holistic practitioners who could help me dig in even further, so I continued on the food journey, continued to fine tune my diet, ran some food sensitivity testing, ran some in-depth testing to find out what other pathogens and infections were causing this inflammation in my body. Each time I ran one of these (stool) tests, which is every six to twelve months, I found that I was peeling back the layers even deeper and really getting more into what else was going on in my digestive system. As I addressed each major pathogen, like the parasite and H. pylori and candida, I was finding less and less major things. Those were showing up on my tests and it was more so just a little bit of bacteria imbalances here and there, but I was able to even more easily address. The vast ways that digestive system issues can present themselves in the body really go well beyond just basic stomach pains and constipation and things like that. A lot of things that can also signal a potential digestive health issue are things like poor sleep, parasites, low energy, and general infections which can raise cortisol levels. Irritability and depression and anxiety, a lot of mood-based and brain-related conditions can arise out of all this. The mind-gut connection is extremely strong. If things in the gut aren’t too happy, then things up in the brain aren’t going to be happy, too. The concept of our gut being our second brain couldn’t be more true. The last one that I typically see with people that’s this kind of hidden sign of digestive health issues are skin rashes or irritation. Constipation, diarrhea, acid reflux are typically the most common things that I hear people say right off the bat that they have. We’re not sitting down as much to have meals, taking the time to chew, sitting at the table for an hour to really enjoy our food. Sit at the dining room or kitchen table with your family, friends, whoever you live with and actually focus on having great conversations, focus on the smell of your food, focus on chewing your food and just being present. Those are two of the biggest thing that people can start to do. Generally, rule of thumb is chew about 30 chews per bite, depending on what the food is. If you’re chewing meats or tougher veggies or nuts or seeds, absolutely you should be chewing about 30 bites and just making sure that that’s fully soaking your food before you swallow it and go on to your next bite. Stress has such a huge impact on our digestive system. Become present with your meal, take a couple of deep breaths before you even dive into your food to become present, leave all those stressors and all the worries on your mind behind, even if for the next 20 minutes. Smelling your food and just becoming closer with it can really help to shift your body into that rest-and-digest state so that your body can divert its resources to the digestive tract. I love the idea of gratitude. For somebody who wants to bring that to a pre-meal activity, that’s fantastic. One of the easiest and, arguably, cheapest way is to begin to go on that process is just by writing down your foods and starting to listen to your body and what is going on.